Cover Photo: A hunting we will go... 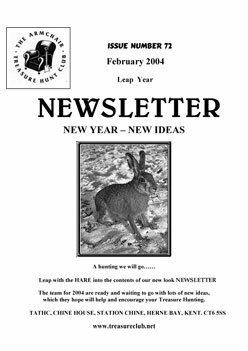 Leap with the HARE into the contents of our new look newsletter. Trevor Waters proffers his solution for Don Shaw's Golden Key. Superstition, Myth and Folklore is the beginning of a regular series. This issue - the hare. Martyn Lambourne offers a signed copy of his hunt, Quest in an exclusive club puzzle. Deborah Hatton and Martin Dennett present the first of six parts making up A Journey Through Merrie England - leading to a buried treasure. Cover Photo: Working It Out - in extreme weather conditions! Anniversary Commemoration being plotted. Looking for the Sun - Shaun Whitehead prepares for laying the Masquerade memorial stone. The mythical Ken Thomas (Dugald McIntosh Thompson), controversial winner of Kit Williams' Masquerade, talks to Sandra Young. 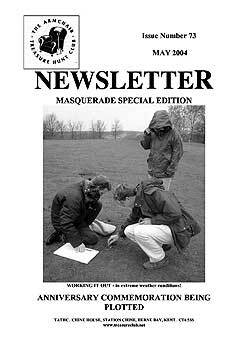 Nick Ball with news of the 2004 Spring Event at Saffron Walden. Martin Dennett and co. tell all in The Hunting of The Pearls. Trevor Waters gives us Part 2 of his Golden Key Solution. Cover Photo: Jokers Wild - John Gibbons and team are successful at the Spring Event. 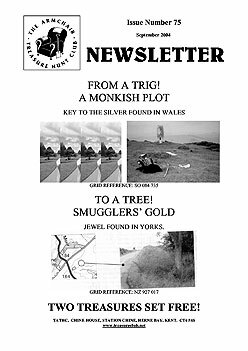 Cover Photo: From a trig (A Monkish Plot) to a tree (Smuggler's Gold). 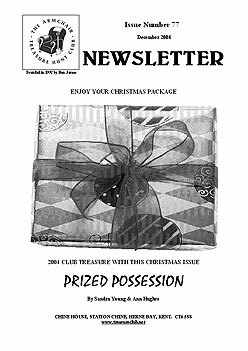 Two treasures set free! ...whilst Milly Dudley describes her own success in finding the prize. 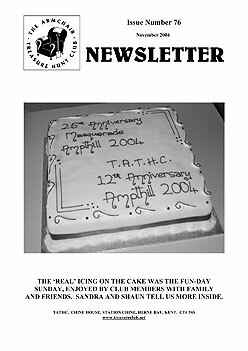 Cover Photo: The ‘real’ icing on the cake was the fun-day Sunday, enjoyed by club members with family and friends. Sandra and Shaun tell us more inside. Mike Smith and Jane Childs present The Second Unnamed Hunt - a mere three words and some symbols! James McLaughlin recalls The Code/Armchair treasure hunting on the ZX Spectrum in part one of a new series.